A Parting Gift — With Legs — For Marin Alsop At The Cabrillo Festival : Deceptive Cadence After 25 years directing the contemporary music festival in California, Marin Alsop bids farewell with Lola Montez Does the Spider Dance, a new piece composed for her by John Adams. 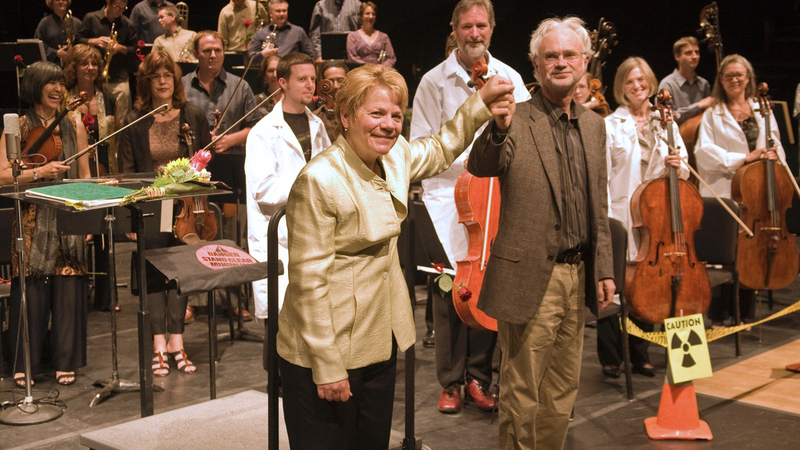 Marin Alsop and John Adams at a performance of Adams' Dr. Atomic at the Cabrillo Festival in 2008. This summer marks my 25th and final season as music director of the Cabrillo Festival of Contemporary Music in Santa Cruz, Calif. What an amazing adventure this has been, working with living composers and being at the center of so many new creations. During my tenure, beginning in 1992, we have premiered 32 festival commissions, presented 85 non-festival commissioned world premieres, 18 U.S. premieres and 75 West Coast premieres. More than 150 composers-in-residence have attended the festival to participate in the rehearsal, performance, and public discussion of their work. That's a lot of composers. Collaborating with each one of them has been a unique journey for me. In this final season I've been working closely with many of the composers I have admired all of my professional years. But this year is extra special. There is a new piece composed for me by my dear friend John Adams. We have been collaborators – or maybe I should say partners in crime – on many occasions over these decades, but this farewell at Cabrillo will be especially sweet. Opening a brand new score is like being a kid again on Christmas morning! The festival musicians surprised me by commissioning Adams to compose a short piece for my final season. I am so touched and humbled by this gift — and in awe of all of these amazing creators. I could "hear" the piece right away, which informs my approach. Listening to the simulation was helpful because I found several discrepancies between the audio and the PDF, including a double tempo moment that John forgot to add in the score. A "nasty metric modulation," he called it in our email exchange. He apologized, and I proceeded to figure out how the poor E-flat clarinetist was going to deal with the abrupt shift of gears. As a conductor, 95% of my work takes place before I ever get to my instrument, the orchestra. Maybe one of the attractions for me is the fact that much of a conductor's time is spent daydreaming: trying to imagine what the piece will sound like, which passages will go well, which will need dissecting, how to fix certain problems and how to share my ideas with the musicians. A new piece has the added excitement of never having been interpreted before — a real thrill for me as conductor, and for the musicians too. This new Adams piece is even more special because the musicians asked John to write it. Most of the repertoire I study was composed decades or even centuries ago, so working on pieces where I can actually talk to the composer is a real treat. My job is to be the messenger of the composer, to try to understand the motivation behind every single note. That's a challenging task when the composer has been dead for over 100 years! When they're alive and well, discovering the inspiration and narrative behind the piece is truly exhilarating. Leonard Bernstein, my teacher, spoke to me often about the narrative of pieces and I am committed to finding that story for every piece I conduct. Lola comes in – sails in – flies in – arrayed in a costume to which Joseph's coat could never think of comparing. She stands an instant full of fire, action and abandon ... She commences to dance and cobwebs entangle her ankles. John will be attending rehearsals and give us comments and input on the spot to create the most compelling interpretation possible. There is no greater gift than this gift of a new piece, and no greater way for me to say farewell to a festival that creates and celebrates new music!